MEXICO CITY — The immeasurable importance of Dada, which arose as a reaction to the unprecedented violence of WWI, is especially important to evoke during this moment of post-truth and “alternative facts.” While there are many concepts to reveal in work from Dadaists like Hugo Ball, Tristan Tzara, and Francis Picabia, an overarching aesthetic of shock often gets overlooked when discussing the movement’s formal contributions to the development of conceptual art, post-modernism, and performance during the 20th century. But Dada was a reaction to the shellshock from which it was born. Today, in the face of accelerated terror, what echoes from history does Dada bring to the context of our times? 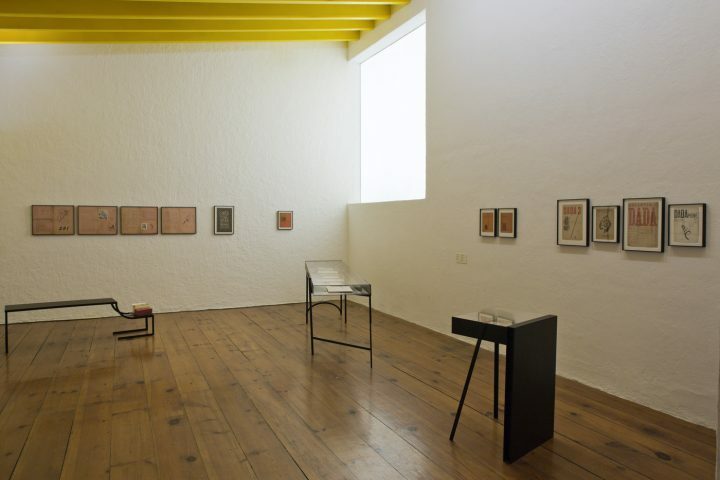 DADA Zúrich, consisting of a suite of original Dada documents, magazine editions, and prints belonging to the Archivo Lafuente in Spain, is now on display in an unlikely exhibition space: the Casa Luis Barragán in Mexico City, where the architect worked and lived until his death in 1988. What does Barragán’s architecture have to do with the Dada work currently on view within its walls? Despite the list of potential intersections between Dada’s deconstruction of art into overwhelming visceral experiences and Barragán’s “emotional architecture,” curator Javier Maderuelo insisted to Hyperallergic during the press preview that there was, in fact, no connection between the works on display and the architect’s residence-turned-museum. Despite this curatorial oversight, allow me to suggest the importance of Dada today as more than an archival exhibition to be appreciated as stagnant historic relics in a vitrine. “Dada’s dedication to the nonsensical and to the simultaneity of contradictions is not only an endeavor to be realized within art but an attempt to confront reality in its true state,” wrote art historian Dorothée Brill in Shock and the Senseless in Dada and Fluxus. The bit about the simultaneity of contradictions rings especially true today: The sensory overload brought about by industrialization and compounded by war during the 20th century has turned into a cascade of digital information and seemingly coexistent but contradictory universes of “fact” in the 21st century. Suddenly, as Tzara and Ball predicted, we’re confronted with the subjectivity of truth and senselessness. Dada foresaw a void of meaning compounded by a lack of objective truth — which paints the landscape for art and life today. 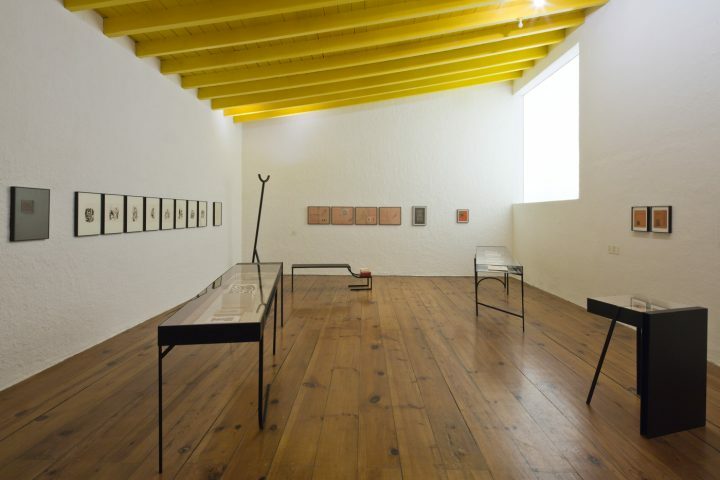 The exhibition at Casa Luis Barragán includes the first issue of the Cabaret Voltaire magazine, in which the meaningless word “dada” first appeared in 1917, along with a series of eight prints by Marcel Janco and a signed Tzara poem. 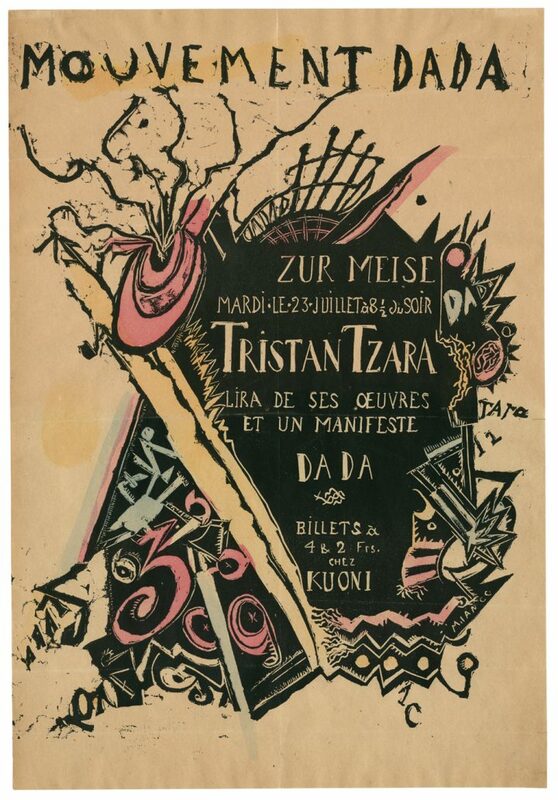 However, because the show is composed of closed magazines and pamphlets written in German and French, without Spanish or English translations, the archival material fails to give the audience a sense of what Dada artists’ work actually was. Overall, the show unfortunately falls into the very object fetishization Dada fought against with performances, collage, writing, and concrete poetry. The publications as objects, which, though perhaps the most tangible legacy of their work, made up only a small part of the Dada practice, don’t actually offer much insight into their creative process, where aesthetics were secondary to purposeful irrationalism. Dada was explicitly political in its attempts to transcend preconceived notions about reality by shocking viewers into questioning the nature of art and modern life. Dada sought to destroy ordinary concepts about reality and to escape from the power games of war that sent the group of young artists fleeing the draft in Berlin to resettle in Zurich, where Ball first worked playing piano in a variety show that turned into the Cabaret Voltaire. Ball and his friends weren’t trying to start an artistic movement, but, in the melting pot that was wartime Zurich, they intended to experiment wildly. Moreover, they sought to go beyond reason, beyond understanding and common sense. Common sense is the enemy of Dada, and its fierce individuality formed as a resistance to banal suffering. As Brill argues, Dada sought to confront the modern void of meaning by denying any familiar form. “The experiment of de-familiarization consists in trying to think to infinity, against the horror of the void, in the wilderness of non-human mental landscapes, with the shadow of death dangling in front of our eyes,” writes Rosi Braidotti in The Posthuman. Dada thinking permeated the 20th century through Fluxus and feminism, as a transcendent practice, and it can be referenced again, as we face the decomposition of established value systems and scientific fact. Dada was antiscientific, even anti-art, as Brill suggests in her book, so as not to be solidified and objectified into art objects with a market of prefabricated meaning. The exhibition of Archivo Lafuente’s Dada documents is shallow in that it portrays the movement through familiar pieces and presentations that provided but a façade of its “simultaneity of contradictions.” And yet, enthusiasts with a healthy curiosity about Dada history won’t want to miss the chance to see the material ephemera commemorating the movement’s legacy on display for the first time in Mexico. DADA Zúrich continues at Casa Luis Barragán (General Francisco Ramírez 12-14, Col. Daniel Garza, Mexico City) through April 30.